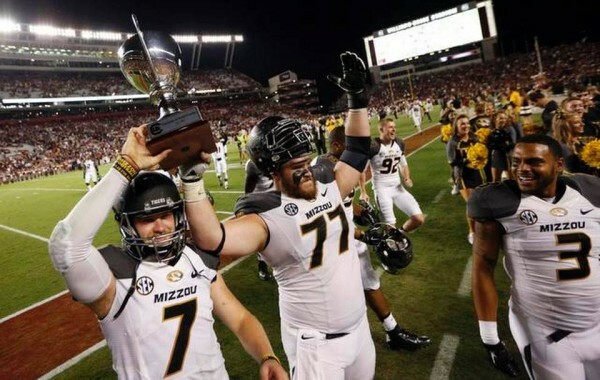 It’s still hard to get used to Missouri playing in the SEC let alone dominating it, but the Tigers pulled off a miraculous fourth quarter comeback in a 21-20 win over the stunned South Carolina to take the lead in the SEC East, remaining the only undefeated team there in conference play. It came down to the final seven minutes of the game. The Gamecocks, leading 20-7 despite a pathetic offensive performance that included just 338 offensive yards and Dylan Thompson finishing with nine carries for -34 yards. Missouri got to him without sending extra pass rushers, yet dominated the line of scrimmage and made it very difficult for Thompson to get clean looks, especially on the deep ball: He was just 4-of-14 on passes thrown 15 yards or longer downfield. Maty Mauk was having a terrible day, completing just 9-of-29 passes before the final two drives that turned the game upside down. He finished with 12-of-34 for just 132 yards, not throwing a single touchdown. However, with Missouri down 13 points he completed two passes for a total of 67 yards before Russell Hansbrough punched through for a touchdown that made it a one possession game. South Carolina were held to -2 yards of offense on their next drive, forcing them to punt. Missouri took their time with the final drive, advancing 51 yards in just over three minutes, in a drive that was mostly about running the ball, and ended once again with Hansbrough rushing one yard for the touchdown, scoring all of Missouri’s touchdowns on the day as they beat a top 15 team while being unranked for the first time since 2003. For South Carolina, it was the first time they lost to a team with a winning record after 11 consecutive wins. It all came down to the offense not living up to what the defense was doing, like holding Missouri to just 2-of-16 on third down conversions, or limiting the Tigers to only 280 yards of offense, and also getting quite often to Maty Mauk, who had one of the worst performances of his career, and still came out as the winning quarterback. 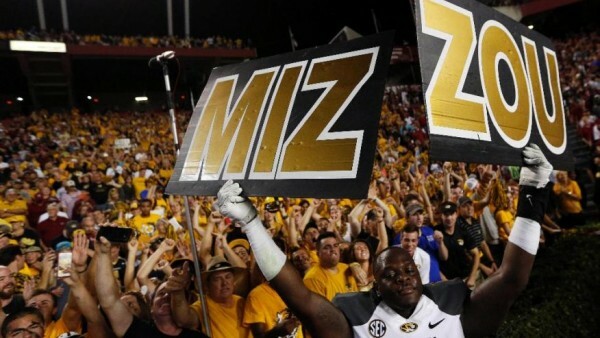 Missouri won their first SEC game for the season, the only team in the East not to lose to a conference rival. For South Carolina, they’re now 2-2 in the conference, which won’t just cause them to drop steeply from their #13 rank as they lose at home for the second time this season, but hurts their odds of reaching the SEC championship game. Their schedule isn’t that difficult the rest of the way – the only real difficulty seems to be Auburn on the road. For Missouri, it’s slightly more difficult, but not by that much. They do have Georgia at home and playing Texas A&M on the road, but the other games are more than simply winnable, and it’ll be a surprise to see them losing more than twice in what remains of their conference schedule, providing what should be considered as the only real upset of week 5 when it comes to an unranked team beating a ranked one.